Gift Cards | Merchant Services Inc. Whether it be a monster retail chain or a local bistro, more and more merchants are offering gift cards as an option for their customers. Gift cards are a valuable tool which can be used to build awareness, increase revenue and profits, and most importantly, introduce new customers to your business. Offering gift cards to your customers is a purely profitable business strategy. 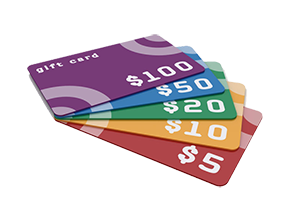 For example, if you purchase a packet of 100 gift cards- all with custom design- and your average gift card sale is for $50, you will generate $5,000 in revenue. If you run at an average of 50% profit margin, you have just earned $2,500 of pure profit in your pocket. And, in most cases, customers using gift cards add their own money at the point-of-sale, increasing your revenue even more. $8 billion in gift cards go unredeemed or uncollected on average every year. That’s 15-20% of pure profit for you from gift card sales alone!